Pass the Cereal: I'm a bit giddy! Olivia's first birthday party has been mentioned on two blogs this past week! And not just any blogs, two blogs that I love to read every day and get tons of ideas from too! I'm giddy (and honestly still a little shocked) to see my blog included on their blogs...so cool! Last week, One Pretty Thing included the party in their Birthday Party Roundup! There were some great parties in the roundup too...you should check it out! I love all the ideas Rachel showcases (DIY, wedding, gift ideas, etc.) on One Pretty Thing. I dream of doing most of the projects and definitely find a few I can tackle each week! Thank you for including me Rachel! 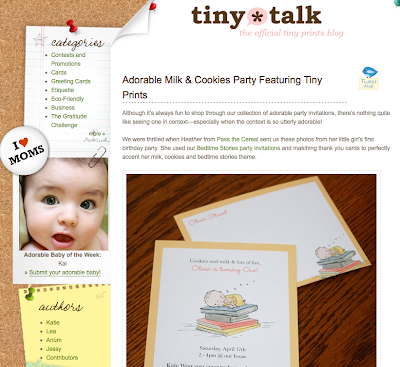 Then yesterday, Tiny Talk, the official Tiny Prints blog, featured Olivia's party. Katie wrote the sweetest post too! I really appreciate all the kind things she had to say and the fact that they featured our little party at all! Thank you so much! And I have to say, check out Tiny Prints if you're looking for custom print invitations. They are really easy to work with (even for Type A personalities like me) and they are fast! Best of all, they have some of my favorite designers in the paper world creating invitation designs for their site (Snow & Graham, Night Owl Paper Goods, Oh Joy!, Good on Paper, etc. )...really cute options if you want something personal without making your own invitations. So yep, I'm a little giddy! But I had better stop giggling and get back to crafting for Mother's Day...I promise to share next week! SO excited for you!!!!!! doesn't get any better than that!! continue rockin' the party world my friend! You have arrived!! Woo hoo!! I told you you're a rockstar!! Both of my kids have birthdays in July, so if you want to plan their soirees, go for it! LOL! Congrats! Every complimentary word is richly deserved -- that party rocked!